With Bethany’s Sin shipping, and sold out on publication, we’ve received a number of emails asking about the next in our series of classic limited editions by Robert McCammon. We’re happy to announce that next summer we’ll release The Night Boat, featuring a full color dust jacket and interior illustrations by Les Edwards. The Night Boat, Robert McCammon’s third published novel, first appeared as a paperback original in 1980. Following on the heels of Baal and Bethany’s Sin, it offered further proof that a writer of great narrative power and limitless potential—a writer who would achieve a significant position in modern popular fiction—had arrived. The story begins with a vividly written prologue in which a German U-boat—sometimes known as an “Iron Coffin”—attacks an unsuspecting merchant vessel, and is itself attacked by a pair of Allied sub chasers. The action then shifts to the present day and to the idyllic Caribbean island of Coquina, where life is about to change in unimaginable ways. David Moore, a young man with a tragic and haunted past, is skin-diving in the waters off Coquina, searching for the salvageable remnants of shipwrecks. He accidentally detonates a long-unexploded depth charge, uncovering and releasing a submarine that has lain beneath those waters, virtually intact, for decades. The battered vessel that rises to the surface contains a bizarre and terrifying cargo that will transform a once peaceful island into a landscape of unrelenting nightmare. The Night Boat is a story of cannibalism, ancient voodoo curses, and shambling, undead entities filled with a bottomless rage and an equally bottomless hunger. But it is also the story of a past that refuses to die, that lies in wait just beneath the surface of the unsuspecting present. Furiously paced and viscerally frightening, this horrific early gem is both an outstanding entertainment in its own right and a harbinger of the masterpieces to come. 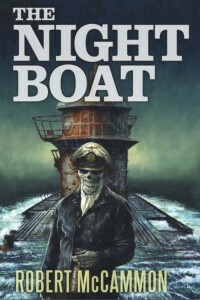 To pre-order The Night Boat, visit the Subterranean Press product page. The ebook of Robert McCammon’s novel of zombie Nazis, The Night Boat, is now available. There will be a Signed, Limited Edition available down the road, but for now, if you’re eager to give this classic a read, you can do so at a mass market paperback price. The Night Boat, Robert McCammon’s third published novel, first appeared as a paperback original in 1980. Following on the heels of Baal and Bethany’s Sin, it offered further proof that a writer of great narrative power and limitless potential-a writer who would achieve a significant position in modern popular fiction-had arrived. The story begins with a vividly written prologue in which a German U-boat-sometimes known as an “Iron Coffin”-attacks an unsuspecting merchant vessel, and is itself attacked by a pair of Allied sub chasers. The action then shifts to the present day and to the idyllic Caribbean island of Coquina, where life is about to change in unimaginable ways. David Moore, a young man with a tragic and haunted past, is skin-diving in the waters off Coquina, searching for the salvageable remnants of shipwrecks. He accidentally detonates a long-unexploded depth charge, uncovering and releasing a submarine that has lain beneath those waters, virtually intact, for decades. The battered vessel that rises to the surface contains a bizarre and terrifying cargo that will transform a once peaceful island into a landscape of unrelenting nightmare. Marshall Thompson has spent the last two months working on a diorama inspired by Robert McCammon’s 1981 novel The Night Boat. 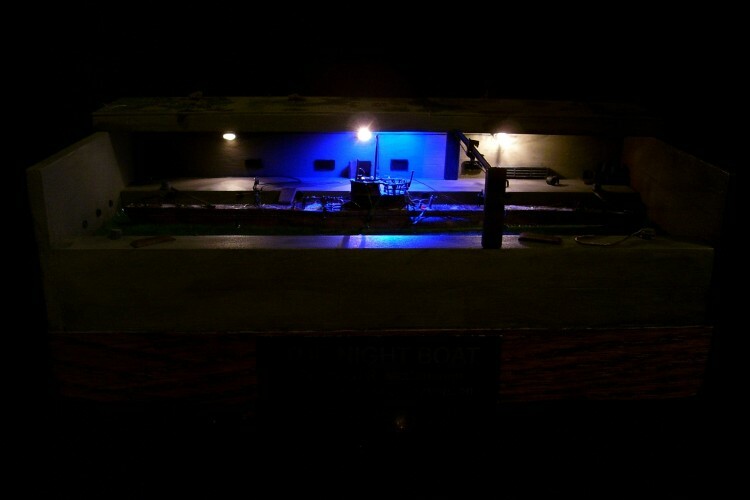 The diorama depicts the raised U-boat and its undead crew working to restore it. You can view several photos of the diorama in the Fan Artwork gallery.